What do you get when you mix a washed up sumo wrestler, a cross-dressing fighter and a 14-year-old YouTube idol? You get a press conference for EA Sports' FIFA soccer game. Yuichiro "Jienotsu" Nagashima, the cross-dressing kick boxer, showed up like he usually does — in a wig and wearing women's clothes. Hey, relax, he's cosplaying as witch character Marisa from the Touhou Project bullet hell shooter! Then Beckii Cruel, a 14-year-old girl from the UK, made her entrance. She has become popular on the internet for filming herself dancing to songs. She now records songs in Japan. Perfect for a press conference about a soccer game. The next person to appear for the event was retired sumo champion Akebono. After sumo, he attempted to enter K-1, a Japanese kickboxing tournament, but was destroyed in match after match. (It got so bad that you actually started to feel sorry for him!) Akebono's wife said in a televised interview that if her husband was not fighting or training to fight, he became irritable and depressed! He has since stopped K-1 (thank gawd) and is now working as a professional wrestler. He has slimmed down considerably. 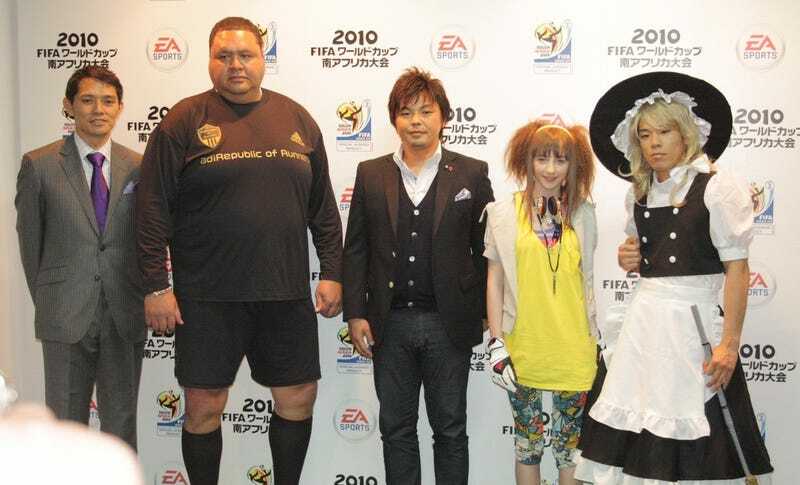 So these are the people EA Sports Japan assembled. To talk about soccer game FIFA 2010. And then Beckii danced. And then kick boxer guy in the witch outfit then joined her. And then EA wondered why Konami's Pro Evolution Soccer is more popular in Japan. And then everyone knew exactly why.